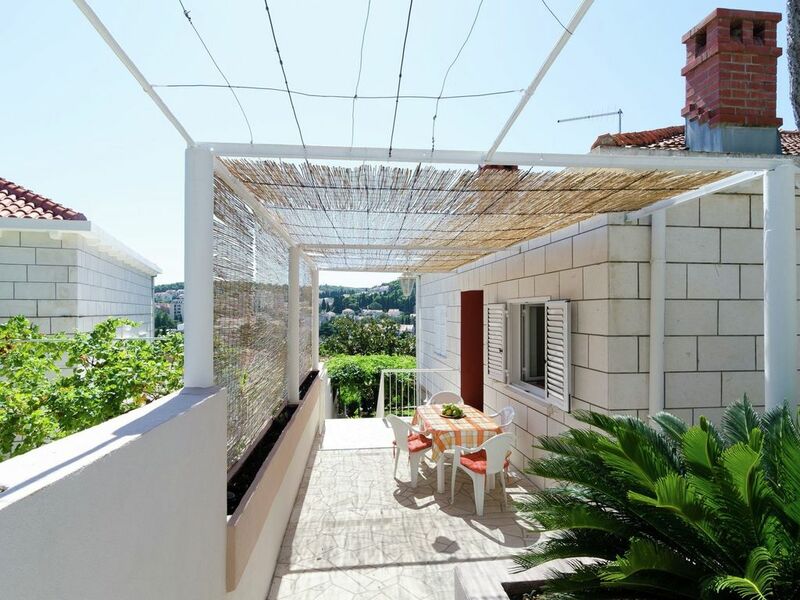 Apartment Melisa is situated in a quiet residential area of Dubrovnik on peninsula Lapad. In the bay of Lapad you will find many hotels, beaches, lovely promenades and walking tracks. Apartment Melisa is only 200 meters far from famous beach called Uvala. Spacious apartment located on the 1st floor features bedroom with balcony, modern living/dining room with double sofa bed of good quality , bathroom and fully equipped kitchen. Located in a beautifull Mediterranian environment apartment offers nice, covered terrace where you could spend relaxing moments enjoying scent of roses. Also, Barbeque situated in the garden is on your disposal. Within the distance of 200 meters you will find a grocery store, numerous beaches , caffes and restaurants. The center of the ancient town of Dubrovnik is only 3.5 km away and could easily be reached by car or using public transport which is 100 meters away from your apartment. Since the apartment is situated in the hill it is recommended to consult the home owner which bus station is the best option in ordre to avoid numerous stairs. UNESCO protected town of Dubrovnik with its ancient city walls, narrow streets and old churches is a place to be explored indefinetely. In 1 Day trip you could visit National park of Mljet, Mostar or picturesque cost of Montenegro. Nette mensen die ons ontvingen, keurig een welkome drankje. En een keurig en netjes appartement. Mooie omgeving. We hebben erg genoten. The owners are really hospitable and helpful (arranging transport for example). Very comfortable, absolutely clean apartment, spacious, newly designed with care, fresh colours, enough space for your belongings, absolutely clean and basic foods such as oil, sugar and coffee are available. One gets a welcoming feeling finding own made liqueur and a bowl of fresh fruits waiting for you. You immediately feel at home here and would like te return, what we actually did for a few days at the end of our vacation period. The kitchen has got alll necessary well functioning equipment and the bathroom is of a luxuoury standard even having a modern washing machine. Balcony with beautiful view on the mountains and part of the harbour. Lots of green, flowers and trees around you. Enough privacy and quiet environment. You have your own dining table for use outside. Lovely and elegant promenade with restaurants and terraces, shops and beach at a short walking distance. From here the city bus takes you to the old centre of town. Very nice and clean apartment with enough privacy. Warm welcome drink in fridge. The owners live next doors and received us very well. Kind and relaxed atmosphere. Short walking distances to bus for connection to the old town and just a few steps from Lapad beach as well as several restaurants. Make a tour to the islands like Lopud, you'll really enjoy it. Also the guided tour in the old town and see-kayaking are recommended.